Of the several variants mentioned in musical treatises of ancient and medieval period, we do not find mention of Saraswati Veena. It seems strange. The most public of all Indian deities, without worshipping whom no function can begin, is always shown carrying a musical instrument, which by default should be Saraswati Veena and ancient texts do not mention it! The faithful find this hard to believe. The term Saraswati Veena represents designation rather than design. Musicians of the Seni school had opted for Rudra Veena as their instrument of choice. They would not teach techniques of playing this to anyone outside the family. They referred to the instrument as Saraswati Veena. In southern part of the country variants of Kinnari Veena were in use and makers of Tanjore were reputed for their craftsmanship. Their Veena came to be recognized as Tanjori Veena. This same instrument was given the name of Saraswathi Veena. Saraswati, goddess of learning, has always been revered. Indian philosophy treats both Word (Shabda) and Sound (Nad) as Brahma. Hence, Saraswati has always been depicted with a string instrument. The shape of this instrument kept changing with times. This emphasizes that idea has always been dominant over matter in Indian Art. The artist was always eager to attribute highest form of learning to the Goddess, hence he did not hesitate to choose the superior instrument of his times over the traditional one. A 1500 BC sculpture, "Roopur"1 shows a woman sitting cross-legged, holding an instrument horizontally at waist level. Scholars opine that this instrument is Vipanchi Veena in which three Vedic notes could be tuned. Thirteen centuries later around 150 BC (Bharhut)2 there is a group of twelve musicians depicting women playing Mridang, Manjeera, Vipanchi Veena, marking beats and singing. Another group of same period sculpted on west gate of Sanchi Stupa - 13 shows one playing on flute, another on Mridang of Bharat period and two playing Vipanchi Veena. Such resources indicate that from third, second BC to sixth, seventh century AD the Veena-s in prominence were Vipanchi, Chitra and Ghoshvati. While Vipanchi carried nine strings, Chitra had seven strings and Ghoshvati was single-stringed. Dr. Lalmani Misra says that on the basis of available sculpture and paintings, one may construe that Vipanchi was like modern Harp, Chitra resembles Sarod and Ghoshvati was built like Ektara. Gandharva Chittorgarh Topkhana sculpture dating 200 BC to 600 AD show Chitra Veena4, Huduk5 and Pinaki6 besides percussion. A panel from Nagarjun Konda10, second century, shows a female playing Chitra Veena as others listen rapt. The same has also been depicted at Ajanta, Cave 411 (second BC - sixth century AD) but the instrument appears to have frets while no mention is found of fretted instruments prior to Matang's Kinnari Veena. A fifth century panel from Pawaya12 of a dancer surrounded by musician gives clear depiction of instruments -- Mridang, Chitra and Vipanchi Veena. One can see the seven key-knobs in Chitra Veena. A female figure in Ellora Cave 2113 (seventh century) plays Alapini Veena, a variant of Ektantri. A sixth century Nalanda15 bronze of Saraswati holding Vipanchi Veena shows figure playing flute on right and percussion on left flank. Veena-player from temple of Harsat Mata, Abner18 shows her holding a different kind of instrument not seen hitherto. By its shape, it may be Kachchapi Veena. Another figure from the same temple19 is the first clear depiction of frets. The Ghoshvati Veena here does not have resonators. Twelfth century idol of Saraswati at Chennakesava temple20, Belur is shown with a variation of Kinnari Veena. This is the instrument which initiated the form of Veena developed by craftsmen of Tanjore. Hoysaleshwar temple26 of the same period at Halebid shows the Goddess playing Ektantri Veena. 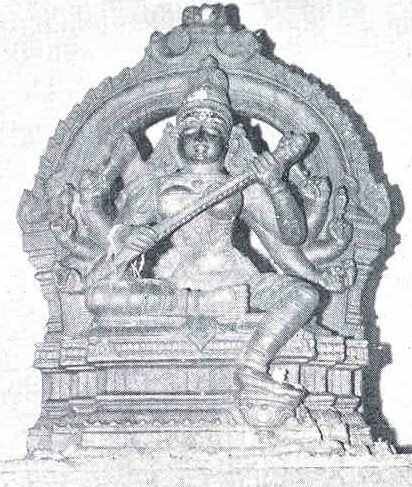 It is only in seventeenth century (Rameshwaram temple27) that Saraswati is depicted playing Rudra Veena, prompted perhaps due adoption of this instrument by the Seni musicians who called it Saraswati Veena. During the medieval period, specially in Ragmala paintings this is the instrument which appears time and again. When in later half of nineteenth century the paintings of Raja Ravi Varma attracted west and became a source of inspiration for calendar art, it was Tanjori Veena that appeared in the hands of Saraswati. For almost a century and half it has been granted the title. Stylization in art is responsible for vague representation of the instrument by M F Hussain. This also marks the end of an era. In case a new instrument becomes popular, unless realism is accepted back in art, it shall never find true depiction. Perhaps rightly so. When Indian instruments have stopped evolving and started fusing into electronic gadgets there is hardly any need to exalt them in the hands of Saraswati. Numbers 1 to 27 refer to pictures in Bharatiya Sangeet Vadya 1973. Second edition, 2002. Picture section. Bhāratīya Shāstrīya Sangīt: Shāstra, Shikshan Va Prayōg. Collection of Essays in Indian music. Articles on modern trends in Indian Classical Music in Bharatiya Shastriya Sangeet: Shikshan, Shastra Va Prayog.